Well, after a 15 year hiatus, the rec-league basketball sensation which wowed Coeur d'Alene has the returned. This inspiring team, known as The COUP, took on the Hillyard Ballers, an elite team of players who've definitely got the title on their minds. Featuring the original core members of Shay, John, and Tom, The COUP showed the league what they were made of in this impressive 74-21 blowout [ed. note - the Hillyard Ballers won]. Though the statistician hasn't been hired yet, Tom took home an impressive 5 points, 5 turnovers, and the most impressive foul of the night. Look for more excitement from these old farts in the coming weeks. What a wonderful benediction. I love how Paul can fit so many things into one verse. Sometimes its a bit too much for my one-track-mind to handle, which is why I like BSF. Forces me to look at just a handful of verses at a time to ensure that I actually read all that is there. I decided to put Google ads on the blog, earn a few cents. So, what's the first ad I see? "Gay. Are you?" I wonder how well a quiz can determine that. Hmm, now that I put that in a text in a blog post, I guess that means I have a higher chance of continuing to see it. 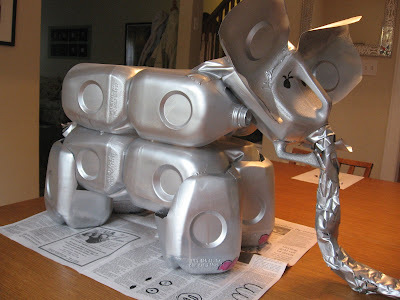 For Emma's LIGHTS program, she had to create something out of 2-25 milk jugs. We ended up making this lovely elephant out of 15. 8 for the body, 4 for the legs, one for the head with pieces for the ears and handles for the tusks. The non-jug portions are the trunk (newspaper wrapped in duct tape, with a cap taped on the end) and the tail (rolled newspaper circular, with the end snipped to look hairy). We spray painted the whole thing grey and put on the toenails and eyes. My biggest recommendation, don't assume you got the jugs clean when you rinsed them out. Use soap. It was a little frustrating, but came out pretty nice for a 2 hour project. I recently wrote about my change of RSS feed aggregators to Google Reader. As a matter of fairness, I'll list the things I've discovered I don't like about Reader. Can't force an update. I have no idea how to know if its really gotten the latest elements. Also, when I refresh my items from, say, overnight, there are huge chunks of data from sites that I know publish more incrementally. The timestamps appear to be the timestamps from when reader retrieved them. Akregator lets you have scheduled checks of your feeds, customizable per feed, as well as re-checking one or all at your hearts desire. No searching. GASP! How can a google product not let me search my feed elements??? Akregator has a quite nice search utility. In short, I've got a huge tradeoff of functionality right now. However, the convenience of google's display and being on the web is winning at the moment. I know you all are dying to hear more about RSS feeds from the overwhelming response I got previously :). So, to sate your desires I figured I fill you in on how I'm surfing the blogs these days. I was fearful my linux box was going to have some catastrophic hardware failure, so I decided to give google reader (http://google.com/reader) another try. Well, they've redone the interface and I'm sorry to say, it leave Akregator in the dust. The ease of use, and the bonus that I can now use it anywhere is almost too good to be true. Since everyone knows their own likes are the best and assumes everyone else wants to know about them, I've put the reader shared items doohickey on this blog. What that means is if I read something that I think rules, I click a little box and it goes over on the right in "Tom's shared blog posts" (though I don't like what I titled that box). Now you get to know what I find interesting, whoopee for you. Anyway, give reader a try, and if you want, I'll point you to some good blogs.